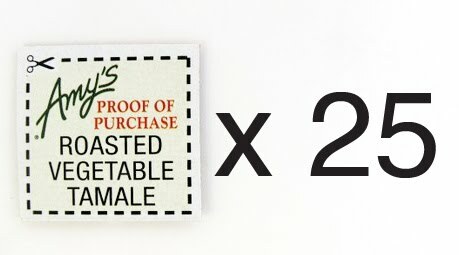 The Laziest Vegans in the World: Amy's Answers The Proof of Purchase Dilemma! I just got word from Katie @Amy's Kitchen that there is a reason to save the Proofs of Purchase from Amy's products! If you collect 25 Amy's Proofs of Purchase, you can mail them in and Amy's will send you a goodie bag with Amy's stuff and coupons!!! Thank you to Katie and Amy's Kitchen for allowing me to sleep at night again. **Update 1/24/11** I got my gift box! Look here. AHH I'm so glad you found the answer. I wasn't aware of the Amy's proof of purchase tickets until your post and it was keeping me up at night too. Ah man, I wish I had known that months ago. You're my hero! What, what?! I will now consume many Amy's products! Can I mail in the whole bag as a proof that I ate it? =v= Hmm. I just figured that if I collected enough of them, I win a date with Amy. Holy crap. I would have at least 75 proofs of purchase by now. WTF. They really should advertise that somewhere. Welp, now I'll start saving them, haha. Is there a limitation on this or is it ongoing? B/c I buy Amy's stuff ALL the time but I had no idea this was going on. From what I understand since it's a new program they are playing it by ear. I'd imagine a limit to how many times a year you could send in POP's. For specific questions on the POP program, email Amy's at amy@amyskitchen.net!